It was suppose to be 3 sets from the Main Set, heck, my pulse was 16 per 10 seconds. Akbar allowed to skip 1 set! Pheeewwww….. Anyway, Mountain calls! I think I want to go! I hope I won’t start with DNS status again!!! Wish me luck! Anyway, I will log my swimming training in this blog on either weekly or bi-weekly basis. I usually did on my IG account, but it’s kind of hard searching it again. I barely use my Garmin. However, apologize for deactivate the comment button! “where have you been?” asked the coach, the soonest I arrived at the pool! I’ve been skipping the course for 7 weeks! 7 weeks! Gee, I can’t forgive myself for this! #lebay. Wednesday, usually full of participants. yet, I do remember we had 800m as Main Set and the coach said “easy main course. Back to basic”. Probably it was a “Welcome Back” banner for me. I couldn’t remember since I was busy catching up my breath. My head position and my left-arm swing were being corrected. Some of us were Sungai Liat Tri participants, and addicted to Tri. 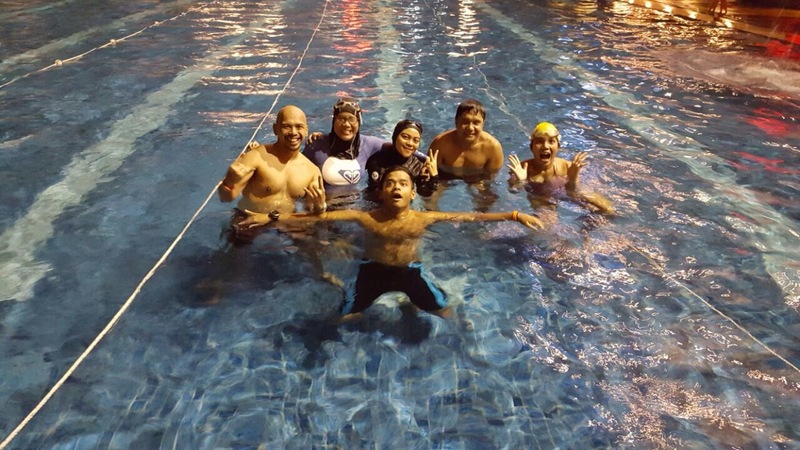 Haleluyaaa….So they came back again, preparing for Bali Triathlon next August! After several drills and about to start the main set, the coaches separated us into 3 group, faster, normal and beginner. What I mean by beginner is not really beginner. This group was for swimmers who just return after hiatus. They will be given either shorter distance ( x 25 meter) or longer time cycle. I volunterily joined that group before the coach yelled “No! what are you doing, Kiky? This lane!” as he was pointing to middle lane. #Blah! with fins : 4 sets of 1 x 50m sidekick, 2 sets of 1x50m slicing the water, change position after six kicks and followed by 1×50 m catch up entrance. 2 sets of 4x50m pull without fins, followed by 4x100m with fins. the dessert was 4x50m regular swim (no fins) maintaining the position. Total distance was 1,800m. During the main set I heard that he kept saying “hanging there, please hanging there!” Idih gimana sih! Gw mau masuk club beginner ngga boleh…… =)) I was the last swimmer to complete the total cycle, for sure…. Less likely my friends come on this day. 8x 25 m WU , (with fins) 2 sets of 1 x 50 m slicing water and 1 x50m catch up. 2 sets of 1 x50m transition followed by 1 x50m stroke count. (without fins) 2x20m sprint + 2x20m six kicks followed by normal swim. The function is to spike the heart rate. Main Set! All with fins attached…the famous scary PYRAMID TRAINING!!!! (50m still maintained around 1:02 – 1:04 and I CLEARLY HEARD that Akbar yelled “Ok, you maintained well, do make a lot of warm up before the race”. Hanging there and…go! 8 x 50m + 400m (the 8th of 50m cycle dropped to 1:07 and 400m was completed 9 mins something).